In the past week, how many times have you thought to yourself, “Ugh, I’m so stressed!”? Have you bemoaned the fact that there are only 24 hours in a day, and you really need more to run your business effectively? Let’s be honest, while running your own business is a huge accomplishment, it comes with a lot of responsibility, and that leads to a lot of stress. Which part of business ownership is stressing you out? If you receive mountains of email each day, it can seem impossible to stay on top of it. The same goes for a jam-packed calendar. How can you stay organized and caught up when new tasks just keep coming? Maybe you’re getting bogged down with creating content. Writing blog posts, newsletters, and fresh web content is time consuming, and that can be incredibly frustrating when you already feel like there aren’t enough hours in the day! Add in the dozens of other tasks you face each day and it can get overwhelming fast. No wonder you’re stressed! Every business depends on technology, but it’s the very foundation of an online business. Are you constantly worrying about maintaining your website? Maybe the idea of updating your web pages makes you break into a cold sweat. 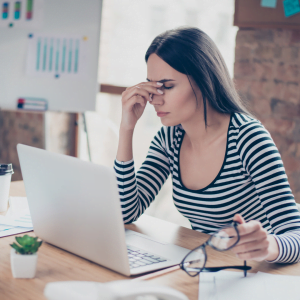 If you’re having actual nightmares about adding products or services to your shopping cart, the tech stress might be getting to you! Of course you want to keep your customers happy – you can’t have a business without them. But you also can’t focus on the future of your business if you spend all your time handling customer service. Client support, customer onboarding, and logistical tasks like invoicing and collecting payments are crucial, but can you do all that alone? Social Media is both a blessing and a curse. It allows you to interact with your audience like never before. You can expand your reach or launch a new marketing campaign with the click of a mouse. But social media moves fast, and the demands for fresh content are relentless. Are you harnessing the full power of social media, or are you letting it pass you by because you simply don’t have the time to constantly create or curate fresh content? Are Facebook ads working for you, or do you feel like social media marketing is just one more demand on your limited time? Wouldn’t it be nice to get all these sources of stress off your plate? Good news! With a single phone call, you can free yourself from all the things that are tying you up and keeping you from focusing on the future of your business. You need an online business manager that comes with a full plug and play implementation team who’s ready to take on all those stress-inducing tasks. Not only will your days run smoothly, you’ll be able to take entire weekends off or even vacation without worrying about work! No more spending Saturdays catching up on emails or fretting about what Monday might bring. Your OBM and plug and play team have everything under control! Let’s free up your valuable time so you can focus on the big picture for your company. Book a call today to learn what an OBM with a plug and play team can do for your business.